A feature film of the Borroloola People's struggle for the recognition of Aboriginal law. A distinguished rarely seen film! Considered a watershed in documentary film, scholars have written about it, but few have seen it. A remote Aboriginal community in northern Australia made the film TWO LAWS under tribal law. As a result, the film's structure, rhythms, pacing are unlike other films. At the same time, this film represents a high mark in the heady, revolutionary, experimental film practices of early cinema which reached it's peak in the 1960's and 1970's. Up until now, TWO LAWS was only allowed to be projected as film onto a theater screen. 27 years later, Facets is releasing it on DVD as a film classic. The voice commentary is by noted film scholar, Bill Nichols, and filmmaker Jill Godmilow. Also on the DVD, Aboriginal and other film commentators place the film's significance in the documentary record. White people have different laws from Aboriginal people." Borroloola in the 1930s. Dramatic reconstruction of a conflict between Aboriginal people and new white settlers and police in 1933. Describes life of the Borroloola community under the Welfare system of the 1950s to the present day. Describes Aboriginal attachment to land; land conflict over sacred sites; the 1977 Borroloola Land Claim; the bargaining strategy of the people between the government, the cattle stations and the mining company. Describes the present movement back to traditional land, the assertion of ceremonial practice and the setting up of cattle outstations. The Borroloola Aboriginal Community is made up of four language groups from the gulf region of the Northern Territory. The people live within a tribal structure and all decisions concerning this film were made within this structure. "I suppose you know these two, Alexander and Caroline. Last year was in Sydney and asked them to come down to make film in Borroloola for our own people. They're here in Borroloola now and we're glad that they came to make this film. They been apply to the government to get some money to make this film which was real good. So its our film and we're going to make really good film out of it." This film is not a conventional documentary - it comes from a different perspective, from Aboriginal community commitment, and in doing so it also challenges notions of filmmaking practice, of history, of ethnography, of objectivity. The Aboriginal people of Borroloola have a traumatic history of massacres, institutionalisation and disposses-sion of their lands. 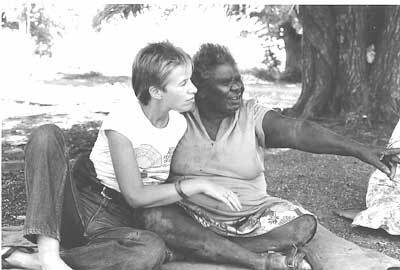 Reflection upon this history is increasingly part of the Borroloola people's basis for action and the consolidation and definition of aims. The request for this film to be made is part of this process. The film is divided into four parts but although this arrangement is roughly chronological the film isn't a straight linear narrative and neither is it divided into four quite distinct parts. There are interconnections between the various parts and interconnections between the past and the present which is dealt with through investigation of history and the way history is con-structed and also of story telling and the processes of story telling. At the beginning of the film there is a discussion about the making of the film and how it's going to proceed. This serves to situate Parts 1 & 2, not just as authentic moments in history but as part of a process which is being constructed and reconstructed and transformed by the very process of filmmaking. Parts 3 & 4 of the film deal with the present struggle for land. This is not only rendered understandable with its reference to the past but places this urgent struggle for land rights in its context as something that has always been the fundamental basis of Aboriginal law.